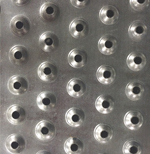 Direct Metals offers many metal grating products that will help you provide a safe and secure workplace. We supply Grip Strut™ safety grating, Traction Tread™ metal grating, Grate-Lock™ steel floor grating, and Perf-O Grip™ Safety Grating. Grip Strut™ safety grating has serrated surfaces that provide adequate traction in all directions and places. This non-slip metal grating is ideal for inside and outside, where mud, ice, snow, oil, or detergents can create hazards for employees. 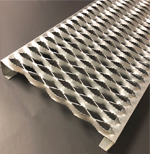 It is common for Grip Strut™ safety metal grating to be used in commercial and industrial metal walkways, metal floor grating, and metal stair treads. Traction Tread™ metal grating can be used for floor grating, safety flooring, planks, ladder rungs, and stair treads. This floor grating features a surface that has hundreds of perforated buttons that provide slip resistance in all directions. These safety features make Traction Tread™ floor grating a practical choice for industrial applications, such as walkways and stair treads. The metal grating is available in many materials, including steel, aluminum, and stainless steel. 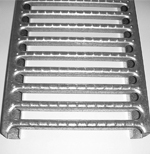 Our Traction Tread™ metal grating is an ADA compliant product. Grate-Lock™ steel floor grating allows for maximum water and airflow while providing traction with perforated buttons that create slip resistance in all directions. 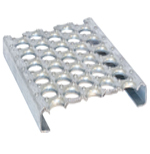 This type of metal grating is ideal for mezzanine flooring, signboard walkways, inspection work platforms, trench covers, safety flooring, metal stair treads (safety treads), and metal rack decking. Perf-O Grip™ is a one-piece plank metal grating that is manufactured into the shape of a channel by a cold forming process. The web of the channel is the walking surface with large debossed holes that are surrounded by smaller embossed traction buttons. Common applications for metal grating include commercial and industrial walkways, metal floor grating, and metal stair treads (safety treads).